Today I’m going to share one of my favorite Rosh Hashanah entrées with you. This idea evolved out of… well, a fish head, believe it or not! Every year, we buy a fish head and cook it specifically for the purpose of the blessing (we don’t actually eat the fish head, though some people do). The words Rosh Hashanah literally translate to the “head of the year” (for more information on Rosh Hashanah, click here). The fish head reminds us to be the head instead of the tail– or rather, to be leaders and not followers. Fish is also a symbol of abundance and fertility. For these reasons, many Jewish families bless a fish head at the Rosh Hashanah meal. May it be Your will, Lord our God and God of our fathers, that we be fruitful and multiply like fish. May it be Your will, Lord our God and God of our fathers, that we be the head and not the tail. A few years back, I started thinking how silly it is to buy the fish head and not the whole fish. After all, fish is a symbolic food for Rosh Hashanah. Why not buy a whole fish and prepare it for the holiday meal, while reserving the head for the blessing? A new tradition was born, and now we serve fish at our Rosh Hashanah meal. Poaching is a cooking method in which foods are gently cooked in liquid—either broth or water—at a very low simmer. 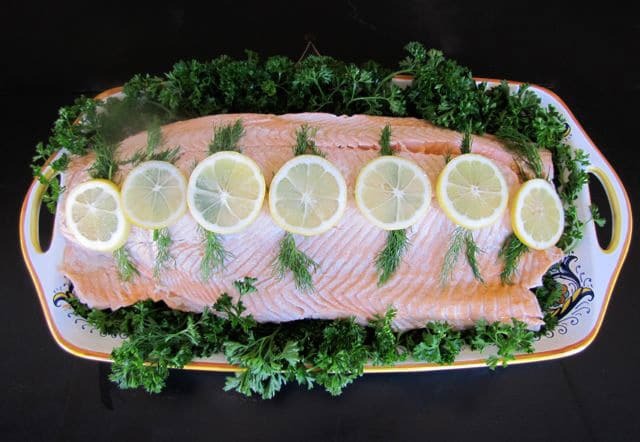 Poaching is a simple, tasty way to prepare fish; it allows the natural flavors of the fish to shine through, giving you a great natural pallet that you can dress up in a number of ways. You can poach a whole fish, whole fillets, or small fillets as individual portion sizes.This blog will focus on poaching large fillets, which is the way I like to prepare it for Rosh Hashanah. Poached fish is very versatile; it can be served either hot or cold, as part of a brunch buffet or as the main course in a healthy dinner. The method requires no extra oil, so there’s no additional fat to worry about. And here’s the best part… once you know how to poach fish, you can use your imagination to create a variety of sauces that will enhance the flavor of your holiday meal. This method of cooking fish is great for people who want to prepare a holiday dish in advance, so they’re not overwhelmed with cooking on the holiday itself. A fresh poached fish will keep well in the refrigerator for two days. This is particularly helpful for kosher Jews who are observing the two-day Rosh Hashanah holiday as a Yom Tov. According to the Talmud, Rosh Hashanah is a Yom Tov, which means that work is not allowed on the holiday, but cooking is—unless one of the Rosh Hashanah holidays falls on Shabbat. Cooking is never allowed on Shabbat. The trouble is, on a Yom Tov holiday, you are not allowed to do any act that is in preparation for the following day—which means you aren’t allowed to cook something in advance to prepare for Shabbat (confusing, right?). This year, the second of Tishrei falls on Shabbat, so many observant Jews will say a special blessing called Eruv Tavshilin which allows them to prepare foods during Rosh Hashanah for the part of the holiday that falls on Shabbat. Poaching fish is a great option for those who want to prepare a dish during Rosh Hashanah that can be chilled and later served on Shabbat. Here’s the way I like to poach fish for Rosh Hashanah. It all starts with a trip to your local fish market. 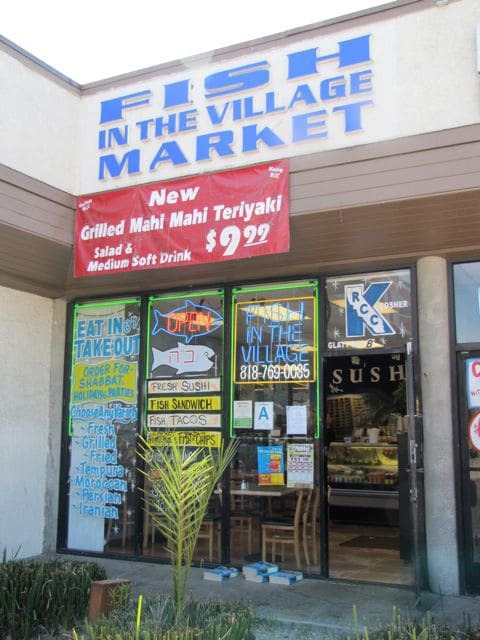 My favorite kosher fishmonger happens to be Fish in the Village in North Hollywood, CA. 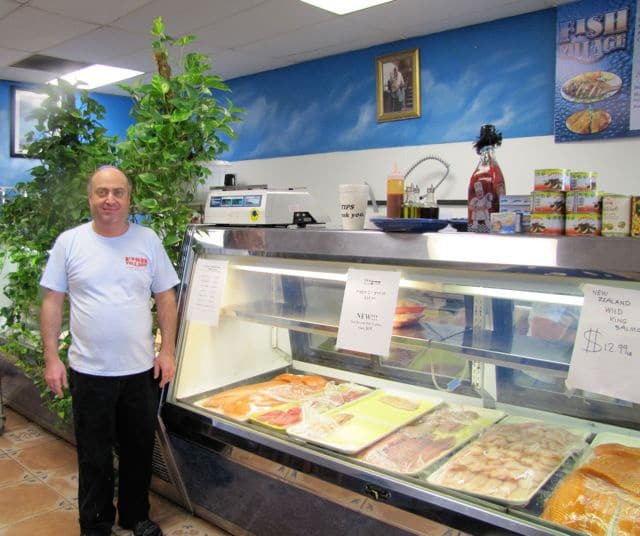 Cameron, the owner of Fish in the Village, lets me know which fish is the freshest and best that day. When you’re poaching, you want to make sure that your fish is really fresh, since you won’t be using a lot of spices to cover up the natural flavor of the fish. Dense-flesh fish like salmon, sea bass, halibut, or trout work best. 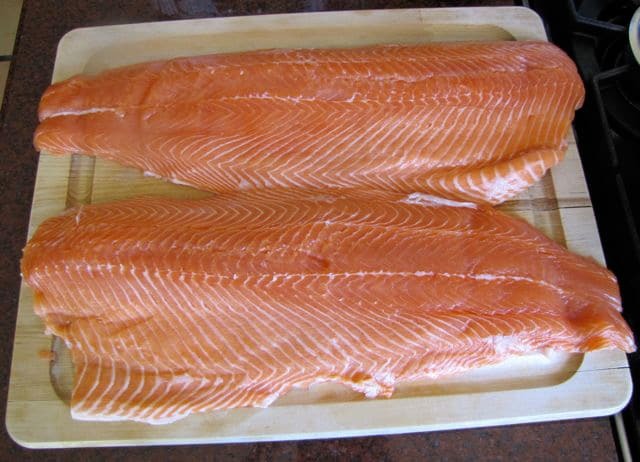 This Rosh Hashanah, I’ve asked Cameron to set aside a beautiful 8 pound whole salmon for me. When you’re choosing your fish, keep in mind that you’ll need between ½ and ¾ of meat per person from fillets, or a little less than 1 lb per person from a whole fish. So, if your whole fish is 8 pounds, you can expect to feed about 10 people with the fillets from that fish. 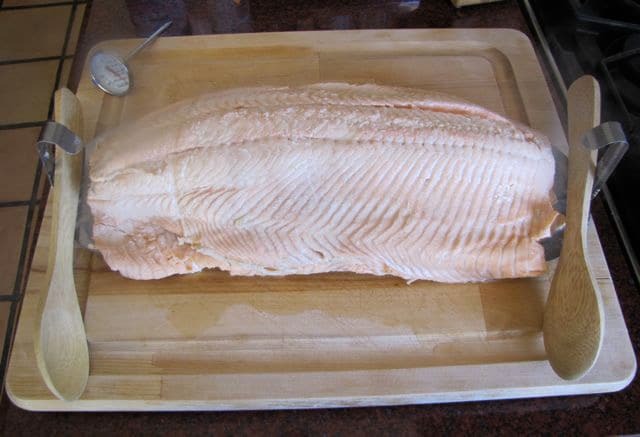 Alternatively, you can also poach individual size fillets that are pre-cut in ½ to ¾ lb pieces. I prefer the larger uncut fillets because they make a nice presentation on the Rosh Hashanah table, and it’s cheaper than buying the pre-cut pieces. Once I’ve got my fillets, I prepare a Court Bouillon—basically just a fancy term for an herbed broth—which will be used to poach the fish. I’ve provided my favorite Court Bouillon recipe at the end of this blog. You can use any Court Bouillon that tickles your fancy. Many Court Bouillons use white wine, so I’ve given the option for that—but I really prefer using lemon juice as the acid in my Court Bouillon. To my pallet, it lends a nicer flavor to the poached fish. Your Court Bouillon needs to be brought from boiling down to room temperature prior to poaching the fish, so make sure you allow enough time for that. The Court Bouillon can be prepared in advance and refrigerated or even frozen until ready to use. I often do this to save time… just make sure you boil it for food safety, then return it to room temperature before poaching the fish. After you’ve prepared your Court Bouillon and brought it back to room temperature, you’re ready to begin poaching. The easiest way to poach is to use a poaching pan specifically made for this purpose. Poaching pans are great, because they’re built to immerse a long piece of fish in liquid. The handles make the delicate cooked fish easy to remove from the pan, and the slightly elevated bottom keeps the fish from cooking too quickly against the direct heat of the pan. If you don’t have a poaching pan, you can prepare a makeshift one using a roasting pan and cheesecloth. Wrap your fillets in a large piece of cheesecloth, tying each end into knots to create makeshift handles that can be used to lift the fish out of the liquid when it’s done cooking. Drape the makeshift handles over the top of the fish while poaching. It’s a bit messier than using a poaching pan, but it will work. I recommend poaching one large fillet at a time for the best results. You can also poach two whole fillets, one on top of the other, but the poaching time will need to be lengthened for the thickness of the two fillets. Place your fillet in the poaching pan and cover it completely with your room temperature Court Bouillon liquid. Turn two burners on to medium heat beneath the poaching pan. Slowly let the Court Bouillon heat up, till it is almost boiling—but not quite. The best way to describe the temperature of the water, I think, is that the liquid begins to “shiver.” It’s a light simmer… not boiling, but definitely hot enough to cook the fish. A boil would cook the fish too quickly, which would make the delicate fish meat fall apart in the pan. The Court Bouillon should be at a light simmer; the liquid should be “shivering” but not boiling. Once the liquid is “shivering,” reduce the heat to low and maintain that temperature for the duration of the cooking period. This will require that you keep a close eye on the poaching liquid; it can easily turn too hot or too cold, so it’s best to check it frequently. The amount of time it takes to cook your fish will vary depending on the thickness of the fillets or the whole fish. Start your cooking time from the moment that the liquid reaches that light simmering state. In general, the rule for poaching is 5 minutes for every ½ inch of thickness. This means you should measure the thickest part of the fish and base your cooking time on that measurement. If your fillets are 2 inches thick, the poaching should take about 20 minutes. If your whole fish is 5 inches thick, it will take about 50 minutes to poach it completely. I find that the cooking time tends to varies slightly depending on the type of fish, so it’s important to check for doneness rather than assume that your fish is fully cooked. The fish is done when the meat turns flaky. For large thick fillets or whole fish, it’s a good idea to use a meat thermometer to check for doneness. Remove the fillets from the poaching liquid by using two wooden spoons to lift the insert carefully out of the poaching pan. 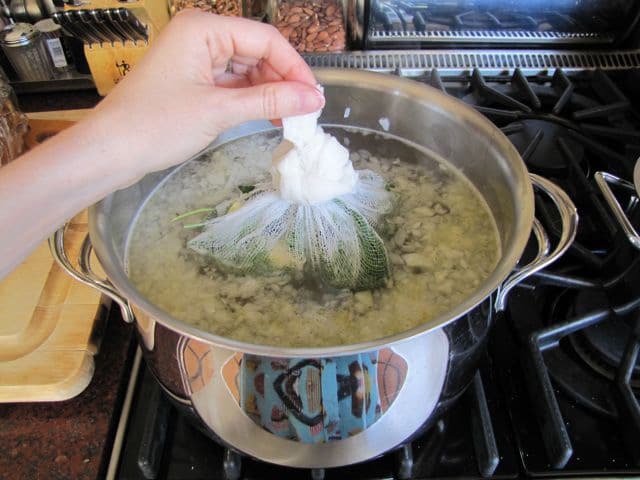 If you’re using cheesecloth, use your makeshift handles to lift the fish out. Place the meat thermometer in the thickest part of the fish to test for doneness. Stick a meat thermometer into the thickest part of the fish or fillet. The fish should have an internal temperature between 125 and 140 degrees. If it doesn’t, the inside may still be undercooked, even if the outside of the fish looks done. If you don’t have a meat thermometer, you can stick a fork into the thickest part of the fish and twist it. If the fish flakes easily, it’s done. Once your fish is well cooked, you can serve it hot right away, or chill it in the refrigerator to serve later. No matter which way you choose to serve it, it’s always nice to garnish it for visual appeal. I like to put the large fillets on a bed of fresh parsley, then cover them with round lemon slices and fresh dill. It makes a beautiful presentation. Poached fish, ready to serve! Serve your fish with your favorite sauce, or a variety of sauces, on the side. For hot poached fish, I recommend my Lemon Dijon Sauce, which appears at the end of this blog. For cold poached fish, try my Herb Mayonnaise. I hope this blog inspires you to try poached fish! 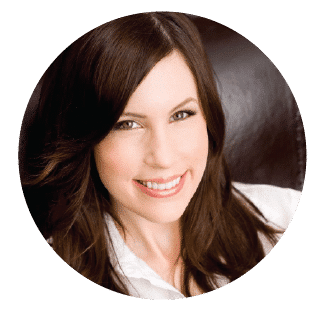 While it may seem complicated at first glance, once you’ve tried it you’ll see that the process is actually pretty simple. A whole poached fish fillet will make a beautiful and healthy addition to your holiday table—and for Rosh Hashanah, it’s a wonderfully symbolic way to celebrate the holiday. First, decide how much poaching liquid you will need to cover your fish completely. This will depend on the size of your fish and the size of your poaching pan. 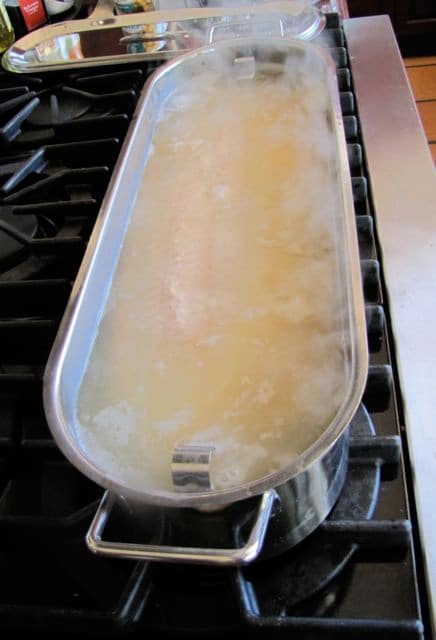 For large fillets from an 8-pound fish (like the ones featured in this blog) in a standard poaching pan, you will need around 12 cups of liquid. Your water and lemon juice or wine amounts will depend on how much liquid you need total. If you’re using lemon juice (which is my preference), 1/16 of the total liquid should be lemon juice, and the rest should be water. For example, if you’re making 16 cups of poaching liquid, 1 cup should be lemon juice. If you’re making 8 cups of poaching liquid, ½ cup should be lemon juice. 12 cups of liquid, ¾ lemon juice… you get the idea. If you’re using white wine, 1/8 of the total liquid should be wine, and the rest should be water. 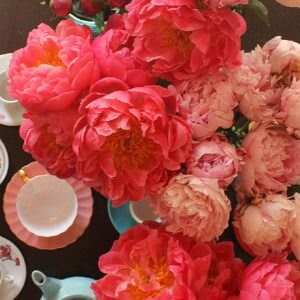 For example, if you’re making 16 cups of poaching liquid, 2 cups of the liquid should be wine—8 cups of liquid will need 1 cup of wine, etc. If you’re using white wine, I recommend adding the juice of two fresh lemons to the poaching liquid for flavor. Now that you know how much water and lemon juice/wine you’ll need, you can start making your court bouillon. In a large pot, melt 3 tbsp of butter over medium heat. Add the onion, celery, and carrots to the pot and stir to coat with butter. Place the lid on the pot and let the vegetables soften for about 10 minutes. When vegetables have softened, add the water and the lemon juice/white wine to the pot. Bring to a boil, reduce heat to medium low, and simmer for a few minutes. Skim the foam that rises to the top. Add your herb bundle to the pot. Salt the broth to taste. Turn heat to low and simmer the court bouillon for about 1 hour. Turn off the heat and allow the court bouillon to return to room temperature. Strain the bouillon into another pot and discard the vegetables and herb bundle. Use the room temperature court bouillon to poach your fish. In a small saucepan, melt the butter over medium heat. Use a whisk to mix in the flour into the melted butter by tablespoonfuls until the mixture is the consistency of thick honey. Add the court bouillon, Dijon mustard, white wine, fresh dill and salt to the pot. Whisk all ingredients together and bring to a boil. Reduce heat to low and simmer the sauce until it thickens to a nice consistency (about 5 minutes). Remove the sauce from heat and stir in the fresh lemon juice. Serve sauce warm over hot poached fish. Mix all ingredients together in a bowl till well blended. 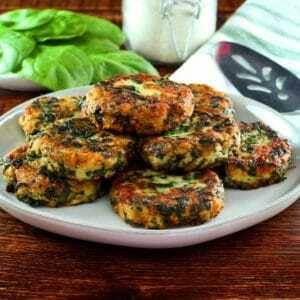 Store in the refrigerator for at least 1 hour before serving so flavors have a chance to marinate. Best served with cold poached fish. Thank you for a wonderful recipe. Everyone raved about it at dinner last night. Will definitely be using this one again. 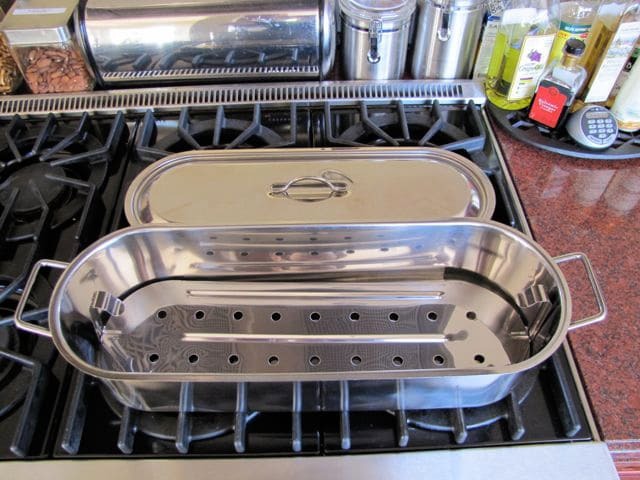 I love cooking salmon and I’m really looking forward to using my poacher for the first time – thanks for making the instructions so clear. A couple of questions: (1) should the skin be removed from the fillet prior to cooking? Or, if it’s left on, how easy will it be to remove after cooking without the fish falling apart? and (2) If I’m poaching 2 fillets consecutively, can I use the same court bouillon for both, or will I need to make 2 batches … one for each fillet? Hi Verna, sorry it took me some time to respond to your comment– for some reason I missed it. You should ask the fish counter to remove the skin for you. Removing it after the fact is tricky, especially with large fillets, and you’ll crumble the fillet if you’re not careful. As for the court bouillon, you can definitely use the same batch for two fillets, no problem. Good luck! thank you for the wonderful instructions…. I love your poaching pan! Jealous! I usually poach the whole fish but your right, the skin and bones are a chore. I will use fillets next time. Fabulous idea! I will try this.